December 2018 Was a Neutral market! 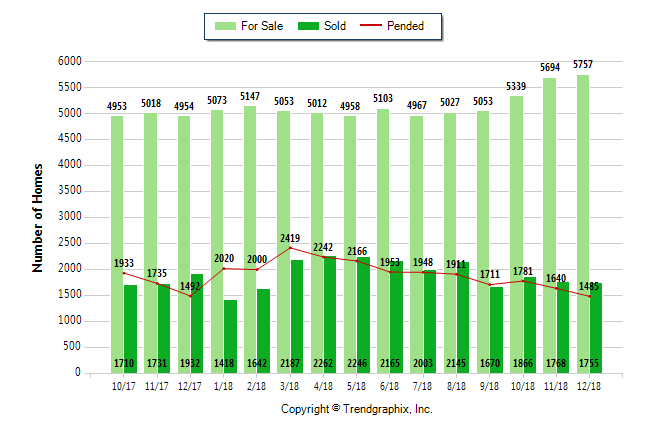 December 2018 was a Neutral market for Pinellas County! The number of for sale listings was up 16.2% from one year earlier and up 1.1% from the previous month. The number of sold listings decreased 9.2% year over year and decreased 0.7% month over month. The number of under contract listings was down 9.5% compared to previous month and down 0.5% compared to previous year. The Months of Inventory based on Closed Sales is 3.3, up 27.3% from the previous year. The Average Sold Price per Square Footage was up 1.5% compared to previous month and up 13.2% compared to last year. The Median Sold Price increased by 1.8% from last month. The Average Sold Price also increased by 1.9% from last month. Based on the 6 month trend, the Average Sold Price trend is "Appreciating" and the Median Sold Price trend is "Neutral". 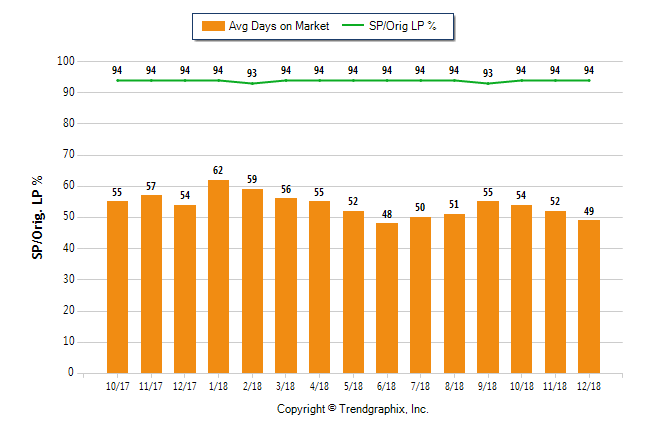 The Average Days on Market showed a neutral trend, a decrease of 9.3% compared to previous year. The ratio of Sold Price vs. Original List Price is 94%, was the same compared to previous year. December property sales were 1755, down 9.2% from 1932 in December of 2017 and 0.7% lower than the 1768 sales last month. Versus last year, the total number of properties available this month is higher by 803 units of 16.2%. This year's bigger inventory means that buyers who waited to buy may have bigger selection to choose from. The number of current inventory is up 1.1% compared to the previous month. There was a decrease of 9.5% in the pended properties in December, with 1485 properties versus 1640 last month. This month's pended property sales were 0.5% lower than at this time last year. The Average Sold Price per Square Footage is a great indicator for the direction of property values. Since Median Sold Price and Average Sold Price can be impacted by the 'mix' of high or low end properties in the market, the Average Sold Price per Square Footage is a more normalized indicator on the direction of property values. The December 2018 Average Sold Price per Square Footage of $206 was up 1.5% from $203 last month and up 13.2% from $182 in December of last year. The average Days on Market (DOM) shows how many days the average property is on the market before it sells. 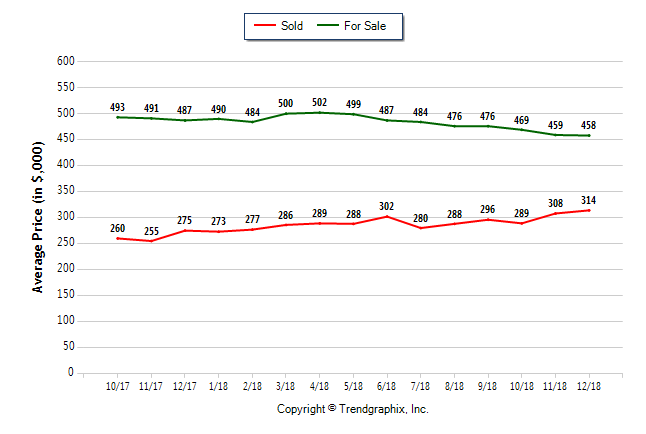 An upward trend in DOM trends to indicate a move towards more of a Buyer’s market, a downward trend indicates a move towards more of a Seller’s market. The DOM for December 2018 was 49, down 5.8% from 52 days last month and down 9.3% from 54 days in December of last year. The Sold Price vs. 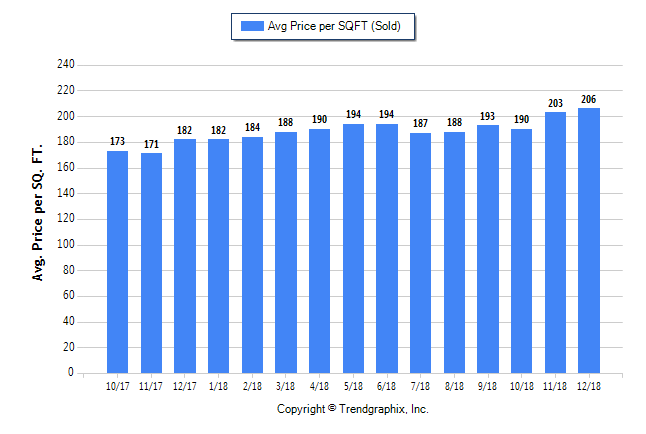 Original List Price reveals the average amount that sellers are agreeing to come down from their original list price. The lower the ratio is below 100% the more of a Buyer’s market exists, a ratio at or above 100% indicates more of a Seller’s market. This month Sold Price vs. Original List Price of 94% is the same as last month and the same as in December of last year. The Average For Sale Price in December was $458,000, down 6% from $487,000 in December of 2017 and down 0.2% from $459,000 last month. The Average Sold Price in December was $314,000, up 14.2% from $275,000 in December of 2017 and up 1.9% from $308,000 last month. The Median Sold Price in December was $230,000, up 7% from $215,000 in December of 2017 and up 1.8% from $226,000 last month. A comparatively lower Months of Inventory is more beneficial for sellers while a higher months of inventory is better for buyers. 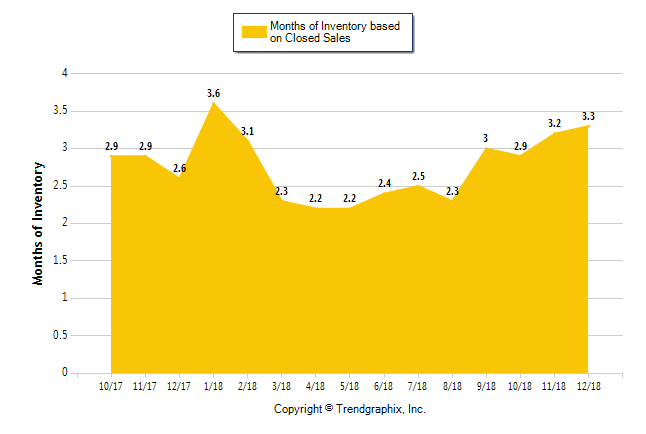 The December 2018 Months of Inventory based on Closed Sales of 3.3 was increased by 27.3% compared to last year and up 3.1% compared to last month. December 2018 is Neutral market. The December 2018 Months of Inventory based on Pended Sales of 3.9 was increased by 18.1% compared to last year and up 11.5% compared to last month. December 2018 is Neutral market. 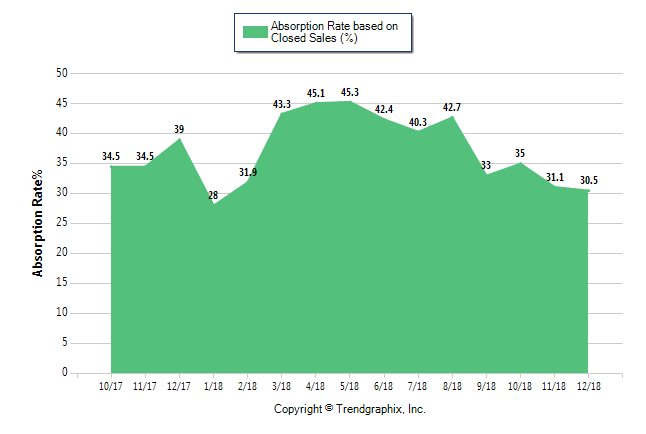 Absorption Rate measures the inverse of Months of Inventory and represents how much of the current active listings (as a percentage) are being absorbed each month. The December 2018 Absorption Rate based on Closed Sales of 30.5 was decreased by 21.8% compared to last year and down 1.9% compared to last month. The December 2018 Absorption Rate based on Pended Sales of 25.8 was decreased by 14.3% compared to last year and down 10.4% compared to last month.